Organizational structure changes. Technology changes. Markets change. Markets change. Tastes change. New competitors arrive. Pyramids get flattened. Work gets outsourced. Globalization intensifies. Notice the word ‘Change’. It is inevitable and you need to be prepared for it. Organizations that are aware of the above changes strive to either survive or grow amidst growing difficulties due to internal and external factors. For these organizations selecting the right change is relatively apparent because they cannot afford the huge costs of pursuing and implementing the wrong change. Lean or Lean Six Sigma is replacing all other change initiatives in many organizations whose leaders believe that moving to Lean organization is the right thing to do. 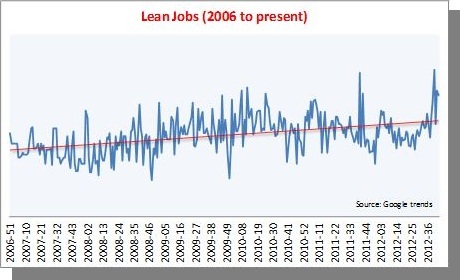 Let’s look at the ‘Lean jobs’ trends. The trend is increasing, indicating that more and more organizations have started bringing Lean trained or experienced people on board to support the change program. This is evident from the fact that jobs in Lean, including Black Belt positions grew and achieved breakout since 2006 (that is growth of greater than 5000% in just 6 years). The question is ‘Why have Lean as a change initiative?” It is because Lean has power to deliver results and it is evident from the success of companies that have implemented Lean. Companies like Toyota, GE, HP and others have been carefully studying the external and internal drivers before embarking upon the Lean program. They looked at the competitive pressures as well as customer expectations to build the right product or service or to design business and manufacturing processes. Organizational change has become a way of life as a result of some key forces such as cost pressures, new competition, and information technology. Organizations are pressured to introduce cost reduction initiatives, manage complex information flows, grasp new ideas quickly, and reduce or eliminate the magnitude of any activity that doesn’t add value to the business. For such organizations Lean is the right tool to obviate issues related to increased costs, reduced productivity, increased burden on machines and people, and workload imbalance. Implementing change requires effort, a huge effort. More than 50 percent of all the effort during Lean program implementation is spent on dealing with the human dimension of change. But what about implications for your organization of such a transformation from the current-state to a Lean state. How would the people react to such a change? What infrastructure changes would be required? Will it change the way you perform your day-to-day work? Lean transformation is no different than any other organizational change program. Lean transformation is a ‘change’ process. Only the fittest organizations with the right approach will survive. They understand how culture impacts change. They know that Lean culture is different from the current culture and that introducing radical change usually does not gain traction. These organizations are aware that Enterprise Lean transformation requires modifying the culture (not radically changing it) to be more in-line with the existing behaviours, beliefs and assumptions of its current culture. So, what is required for an organization to change its culture in favour of Lean? Whether you are new to Lean or part of the existing Lean initiative, whether you are in favour of it or not, the ‘Make Lean Happen’ course will change your perception and approach toward implementing a Lean program and build confidence in you to accept it as necessary initiative. It is designed to trigger enthusiasm during the different stages of Lean implementation. The course will demonstrate how to use Lean tools in practical situations and how doing so can modify the behaviour of people and transform the organization gradually to the desired state. Finally, the Lean journey is never over. Change is constant. Just as you want to work continuously to achieve your most ambitious and desired life goals, your organization leaders will always strive to continuously reduce costs, increase productivity, and reduce waste to achieve the organization’s goals.